Even little girls can use a pair of basic boots in their wardrobe! These simple side-zip boots go together quickly enough for the intermediate-level sewist that you can make up several pairs in no time at all. Featuring a simple side zipper for easy dressing, the boots made with this PDF download can be dressed up or down, depending upon your mood and choice of trim. Make a pair in each of your favorite colors and you’ll be ready for whatever occasion arises. Wear them with jeans or dresses, mini skirts or even shorts. Pull your pant legs down over the top of the boots or tuck them in. Leggings or tights are also great fun. 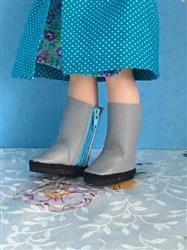 Adapted from our original Matilda's Closet Basic Side-Zip Boots pattern for 18-inch dolls. This pattern is compatible with the Shape 2 Pixie Pack pre-cut soles. These boots turned out really cute! I made them in red with turquoise trim. I used thin Velcro in place of zippers. Worked well! I have plans to make more! They turned out very nice. I hand basted the pieces and zipper before sewing them on the machine, pinning never works very well for me. I used a very contrasting color thread so it would be easier to pick it out after sewing them with the machine. I also machine basted a 1/4 inch guide line at the base of the boot. Then I made V shape notches at the toe and heal, being careful not to cut past the stitched guide line. I found this helped with the leather/vinyl to lay flatter and not get bunched up and bulky. I tried using the hot glue gun on the first boot I made and it was one big a gloppy glue-y mess for me. I burnt my fingers too! So, I switched and used a fast grab tacky glue. It takes a little longer with this glue, you have to hold it in place until it sets up, but the finished project turned out better.